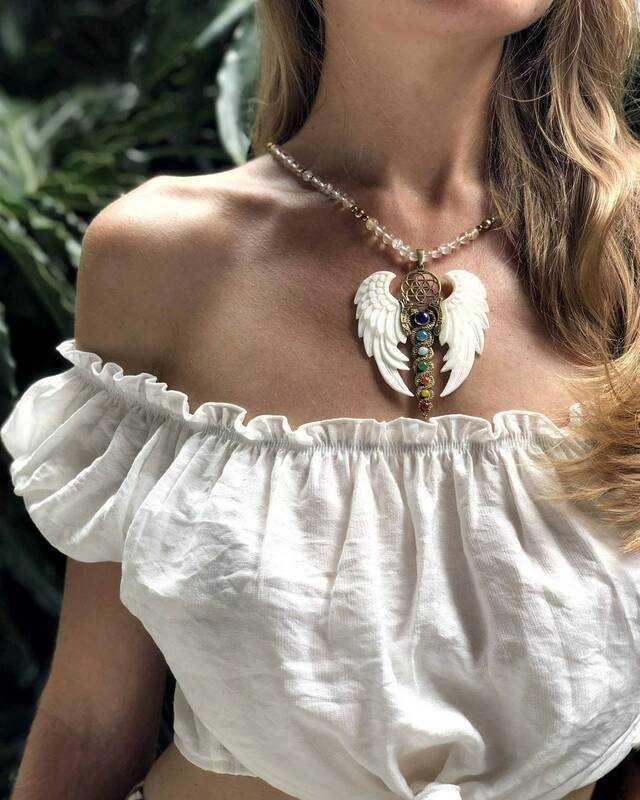 Join us in the Feather Tribe with this stunning necklace cast in brass Kundalini 7 chakras and Sacred Geometry Seed of Life Symbol with White Wings hand carved from bone. This beautiful sacred pendant comes on Clear and smoky crystal, Golden Hematite Beads with a Free Feather Tribe Gift Box! Enjoy the highest vibes with your new Priestess Wings. Created with Spirit in mind, this piece is as sacred as we can conjure. Kundalini refers to a form of primal dormant energy (or shakti) said to be located at the base of the spine. Often called the “sleeping goddess” or “serpent power”, it is represented as a serpent coiled around the first chakra or root chakra at the base of the spine. As Kundalini rises and travels up the spinal column, it passes through each of the chakras on its way giving each a boost, so to speak, and making it light up. Kundalini brings us to a higher state of consciousness. This is the process of the energetic awakening of the human being and the expansion of prana upwards into the higher centres of the body. She, rising from the lowest to the highest lotus center will pass through and wake the five between, and with each waking, the psychology and personality of the practitioner will be altogether and fundamentally transformed. The Seed of Life is a symbol of fertility and creation. It represents the seven stages, steps, or days of creation. The symbol itself is a powerful tool for accelerated spiritual growth. When wearing the Seed of Life symbol on the body it has been known to have powerful healing benefits, helps to dissolve fears, assists in connecting to the higher self, stronger self awareness and reveals the innate harmony in the template of all life. This pendant promotes the creation and manifestations of your dreams. This pendant measures 3.54 inches (9cm) from top to bottom. Together with the beads the necklace is 15.55 inches (39.5 cms) long. The Kundalini with Flower of Life symbol is cast in brass with inlay of semiprecious stones. The white wings are hand carved from buffalo bone. The pendant comes on clear and smoky crystal and golden hematite beads.